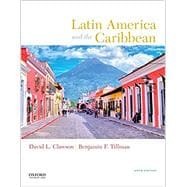 by Clawson, David L.; Tillman, Benjamin F.
Respected by scholars for its currency, clarity, authority, and rich visual and map program, Latin America and the Caribbean: Lands and Peoples elucidates the commonalities in this highly diverse, rapidly changing region, making it more comprehensive than ever for students and instructors. The sixth edition has been meticulously updated in order to take into account recent changes in the region and to more strongly emphasize environmental concerns. David L. Clawson is Emeritus Professor of Geography at the University of New Orleans. Benjamin F. Tillman is Chair of the Geography Department at Texas Christian University. Each chapter ends with Key Terms, Suggested Readings, and Electronic Sources. Chapters 2-11 and 13 also include Summaries. Conclusions: Are Latin America and the Caribbean Overpopulated?